Making your own table cloths, napkins and runners is easy – anyone can cut a square or rectangle of fabric and hem it on all four edges. 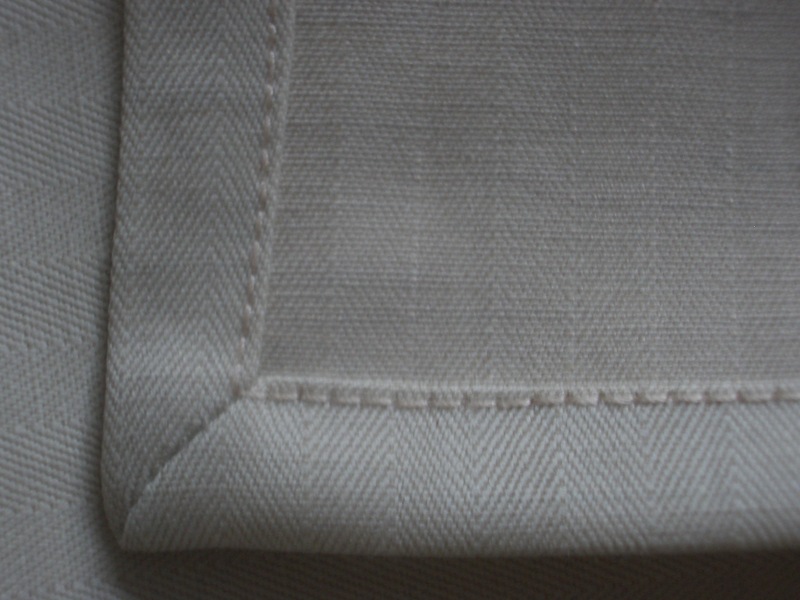 Mitred corners lift table linen from the ordinary to the special, but they are a little tricky to get right. This is my foolproof method. If you are using cotton or linen fabric, wash it first to pre-shrink it and remove any finish, then press it with a steam iron. Pull threads to ensure you are cutting on the straight grain of the fabric, both widthways and lengthways. 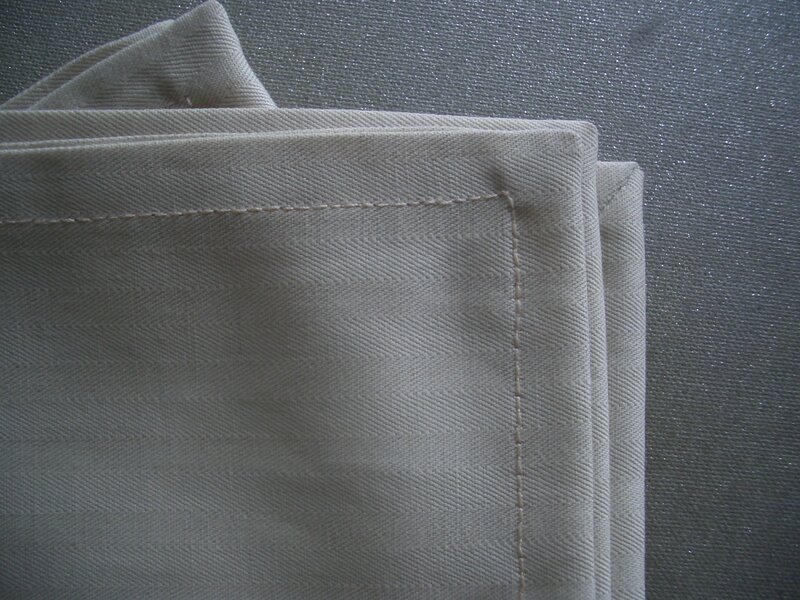 Allow ¾” to 1″ all the way round for hemming, in other words cut a square that measures 23″ if you want to end up with a 21″ square dinner napkin that has a generous 1″ hem. Less formal napkins for lunch or breakfast can be smaller, and teatime or canapé napkins smaller still. If you are making a table cloth, allow a drop of about 12″ all the way around, plus the hem allowance. Press the full amount of the hem (¾” or 1″) under on all edges. 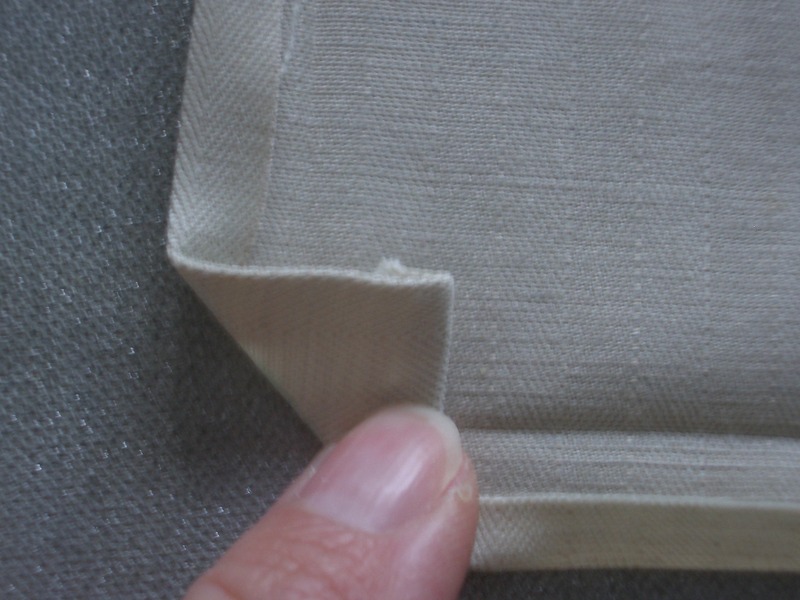 It’s a good idea to mark the hem depth on a scrap of paper and use that as a guide. 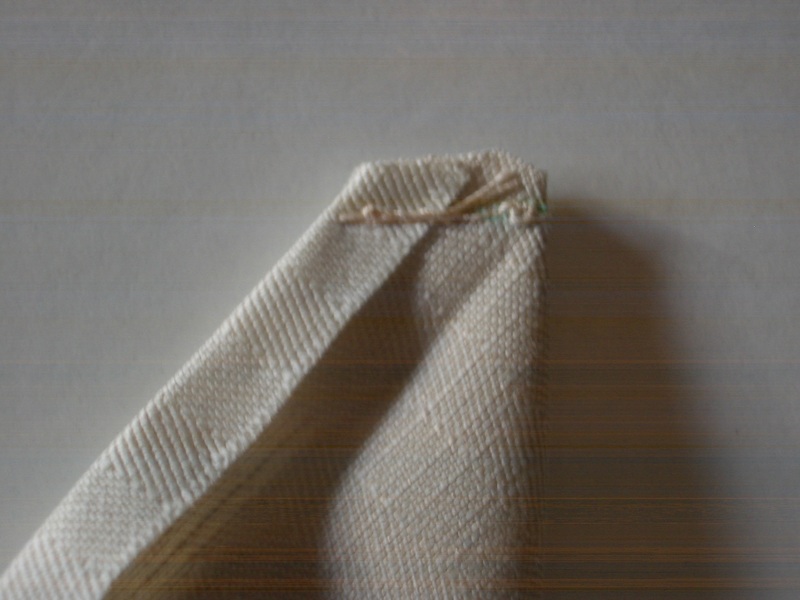 Then press the raw edge under by ¼” to make a double hem, taking care not to iron out the first crease. Now for the clever bit. With the right side down and keeping the ¼” hems tucked under, fold a corner back with the two sides of the triangle formed by the edges of that corner parallel to the edges of the rest of the piece. These two sides of the triangle should then be of equal length. Use the iron to press in the diagonal crease across the corner. Repeat on the other corners. Depending on the fabric this may not be necessary, but I like to use a water soluble crayon or tailor’s chalk to go over the diagonal crease on the wrong side of the fabric. This is the line you will stitch along to make the mitred corner. It’s green in the photos. Fold each corner, right sides together, using pins to make sure the top half of the stitching line is exactly on top of the stitching line on the underside. 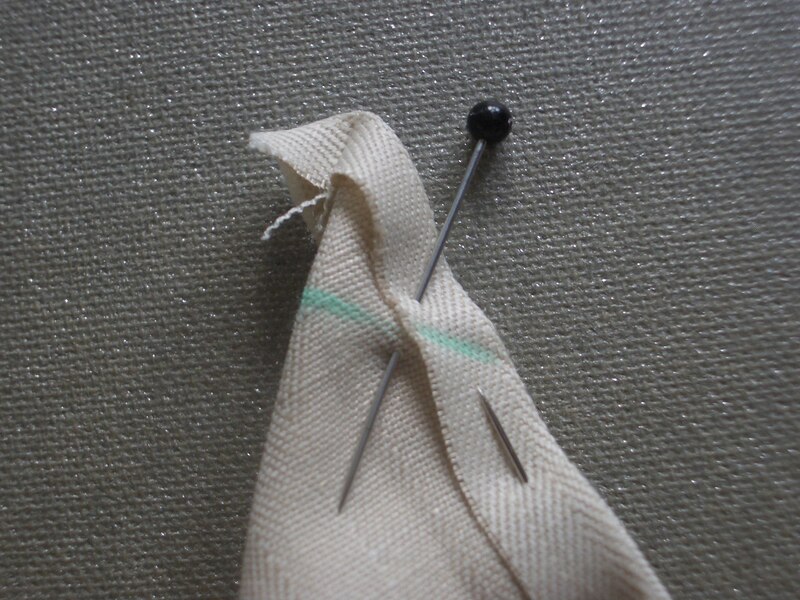 Pin at right angles to the stitching line and sew along it using a small stitch. Turn the corner right sides out to check it looks like a good, 45° mitre. Assuming it is, finish off the ends, trim the seam, press it open with your fingers and turn it back right sides out. Repeat with the other corners. Pin or tack the hems in place along the fold lines that were creased originally and then sew all the way around close to the edge. Press and voilà, fancy table linen with very little effort.